Hazrat Khawaja Sufi Muhammad Azmat Ullah Shah, Sajjada Nasheen of Naqeebabad has announced to support Imran Khan. 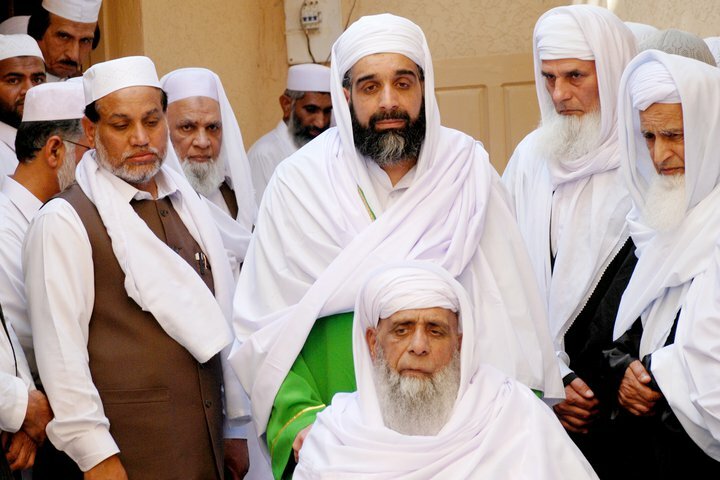 Addressing thousands of followers of Naqeebi spiritual chain, he said that all the saints of that time supported Quaid-e-Azam Muhammad Ali Jinnah for the creation of Pakistan and now when Imran Khan has taken initiative for its rebuilding, the custodians of Dargahs in the country should support his cause. He further said that after the creation of Pakistan, the saints limited themselves to their Dargahs, but now it was need of the hour that they should support Imran Khan. He added the powers which were against Quaid-e-Azam and Pakistan Movement have now united against Imran Khan and are afraid of him because he would not allow corruption in the country. He said his millions of followers in Pakistan and abroad will support Imran Khan. thats really needed for the day. keep it up khan sb, we need change against the bad work. Yet another Sajada Nasheen to join PTI–slowly but surely this party will become yet another party like the PML(Q) or MQM or JUI(F), or PML(N) or even PPP. Good move and right to put his weight against the gangs of thugs! way to go Imran, now make it happen!